We saw an M777 howitzer lowered all the way to the ground. An Army sergeant explained that the only time it’s lowered all the way is when the enemy is close. “If you’re receiving contact on this howitzer, that means all your front lines are not there anymore,” he said. FORT BLISS, Texas – At one point, as the soldiers above were showing me around the massive M777 howitzer, they lowered it all the way down so that it was parallel to the ground. Given that the howitzer is meant for support, I was asked why and in what situation they would need to lower it that far down. Sgt. Shaw, who has served in Iraq and Afghanistan, told me the only time it’s lowered all the way is when the enemy is close – not a good position to be in, given that the cannon is meant for support. Shaw said his crew once took contact when he was in Afghanistan, but he understandably didn’t want to go into detail. 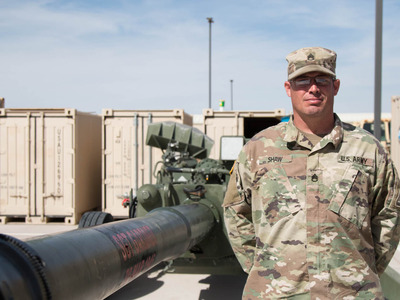 “If you’re receiving contact on this howitzer, that means all your front lines are not there anymore, or they have been able to flank the infantry,” he said. Operated by a crew of eight to 10, the Triple 7 howitzer fires 155mm precision and non-precision munitions. The non-precision guided munitions have a maximum range of 18.6 miles, while the Excalibur precision-guided rounds have a maximum range of 25 miles and are accurate to within 30 feet. 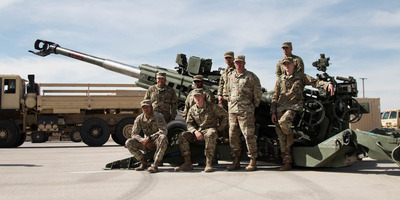 The howitzer can also fire up to five rounds per minute, or two rounds per minute sustained. During one deployment to Afghanistan, Shaw said his crew fired the howitzer while lowered at the enemy eight to 10 miles away. So even when completely lowered, the Triple 7 still has range.